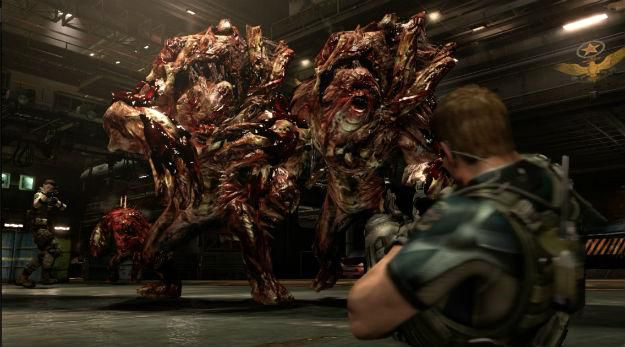 Resident Evil 6 was the first numbered entry in the long-running series that was more often panned than it was praised. And while the game’s initial sales were brisk, Capcom acknowledged that its numbers eventually weakened, forcing the publisher to lower sales and financial estimates. The cover system sticks you to surfaces even when you didn’t intend to. The AI partners in the single player campaign’s co-op are obtuse. You fight zombies with guns and enemies that look like kaiju. Boss battle are sometimes confusing and have too many phases, making them long and tedious. RE6 relied heavily on quick-time events and cutscenes, both of which ruin the pacing. Navigating the inventory is a chore. RE6‘s biggest crime is that it’s more like a summer action flick filled with huge explosions than a scary/tense survival horror game. Not that there’s anything wrong with action games or movies; they’re actually pretty awesome, especially when done right. By action standards, however, RE6 is quite pedestrian. Admittedly, this more action-oriented focus started in RE4, which is widely regarded as the best RE game. The problem, however, is that RE6 has this nauseatingly stronger emphasis on generic action, making it barely unrecognizable as a chapter in the series that started the survival horror genre. There’s no mistaking what “works” in RE: the moody, spooky atmosphere that the entire series is known for. This ambience is essentially in every numbered installment, save for RE6. RE5 may be a bit more action-oriented than its predecessors, but it still largely retains that moodiness. If Capcom were to significantly tone down the ridiculous, over-the-top action feel in subsequent games, some of the other issues (including those listed above) might be resolved. For instance, you won’t have to fight gun-wielding zombies and enemies that look like kaiju (! ), which is un-survival-horror-like. The frequent, pace-wrecking quick-time events and cutscenes may be reduced as well. The idea behind the real-time inventory is brilliant: bringing it up won’t pause the game, thus maintaining the tension. The system is a chore to use though, since finding any item takes so much time. My suggestion: retain the real-time aspect but reintroduce the inventory system used in RE5, which lets you assign shortcuts for weapons and items on the directional pad. RE6 boss fights can be mind-numbingly long. Why? There are just too many phases in each. How many times do you have to fight a boss to kill it anyway? Furthermore, it’s not always clear what you need to do: are you supposed to stay alive long enough or do you just inflict a certain amount of damage? Are you even hurting it at all? This tedium can be addressed by giving players better feedback; if the boss is hurt or if you need to shoot something first, it should be more apparent. Fewer phases wouldn’t hurt either. This mechanic is a hallmark of the action genre; it won’t be needed in survival horror, unless the zombies shoot back. RE6‘s AI companions may have been somewhat improved since the previous game but I think they should be taken out of the single player campaign; this heightens the feeling of isolation and makes the game creepier. The campaign co-op should be retained, of course; I just think you shouldn’t have to deal with annoying AI companions when playing solo. Granted, the previous ideas I’ve discussed is pretty much what many game companies do: produce samey sequels. Because of this, I’ve added a third step: add features to keep things fresh. RE creator Shinji Mikami had the same idea when developing The Evil Within, which introduced gameplay elements like sneaking, setting enemies on fire to destroy them, crafting crossbow bolts, disarming traps, and sprinting. As a result, The Evil Within felt different despite having similarities with RE. The new mechanics don’t have to be ground-breaking; they just need to be well implemented and should suit the survival horror atmosphere and gameplay. For example, instead of having the ability to perform pile-drivers on zombies, the next game can add a reloading mechanic similar to Gears of War, except the weapon jams if you screw it up. Now imagine doing this while zombies are swarming you. I’ve always believed that returning to its roots is most likely the path that RE must take for a proper comeback. The indications have always been there: the previous numbered installments were survival horror games; for the most part, these games were well received by fans and critics and sold pretty well; and more importantly, it’s what most fans want (Capcom producer Michiteru Okabe actually acknowledged this). So what about you? What do you think should RE do to recover? Do you think Capcom should continue its over-the-top action route, or should it revisit survival horror? Are there any elements that you think should be added to make future RE games more interesting? I’d love to hear what you think. Share your thoughts in the comments below!